This is second time going to korea and this time I tried a lot new things. How to go there: First, we have to get to Gangbyeon Station where the Dong Seoul Bus Terminal is located at. Get a bus ticket going to Jinbu Intercity Bus Terminal and Pyeongchang Trout Festival is 10 minutes walk. The bus operates 24 times a day with 30 to 40 minute intervals (06:22 – 20:05). Bus fare is 13,100, 10,500 and 6,600 won for adults, teens and kids respectively. The journey takes around 2hours plus to 3hours plus depending on the traffic condition. When we arrived at the festival, it was really crowd with people. 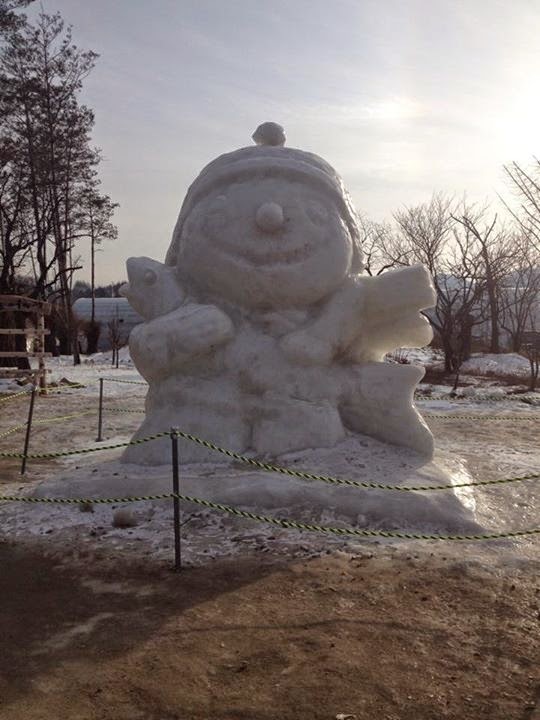 The whole place is also decorated with nice ice sculptures. There are quite a lot different activities to play like sledding, top spinning, riding 4-wheel ATVs, snow rafting and sleigh trains. 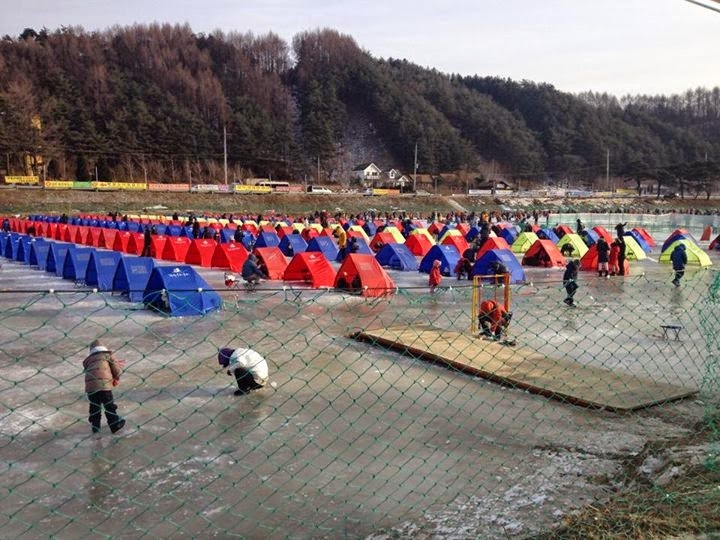 There are two types of ice fishing: In the tent (20000won) or open air(13000won). If you are going to ice fish for a long period of time, I suggest you get the tent. Other than the entrance fee, we have to buy fishing rod from 3000 to 15000won. 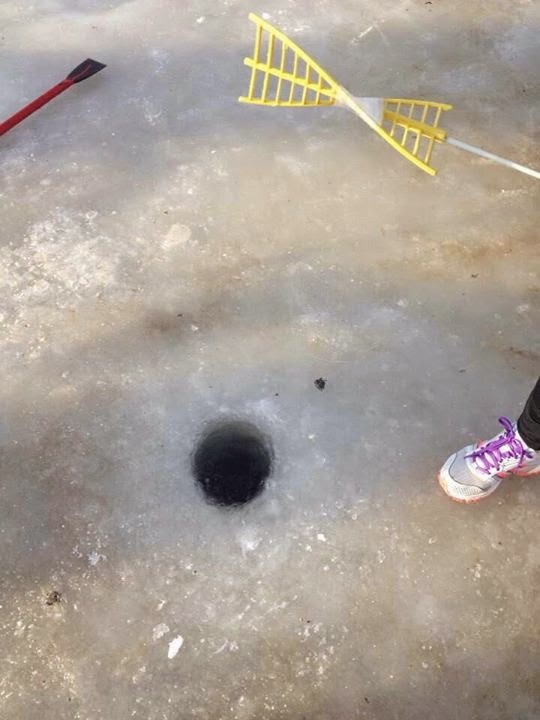 The hole to fish *It might be frozen so u need to get a metal stick to clear the ice before u can start fishing. Let start fishing!! We would be using fake bait to catch the fishes. The fishes underneath is constantly replenish by the staff using machine. Some people are quite lucky manage to catch the fish after a while... We spent around 1.5hour trying to catch but we failed -.- We decided to call it a day and walk around to explore more. It is really quite a nice experience to ice fish. We didn't manage to try out much activities as we arrived late in the afternoon. 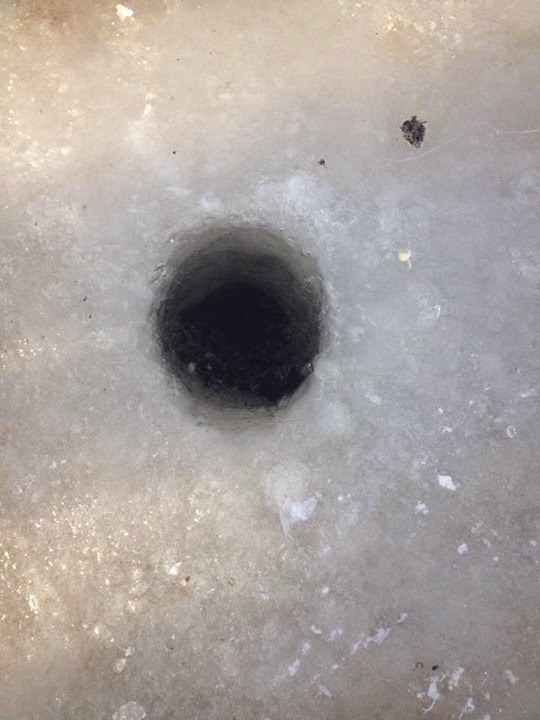 I would recommend coming over early in the morning and try out ice fishing so you can also get to try other activities in the afternoon.